Dr. Michael D. Hart currently serves as Director of Bands and Assistant Professor of Music at California Lutheran University. At Cal Lutheran, he conducts the Wind Ensemble, provides lessons to all trombone, euphonium and tuba students, teaches courses in music theory, ear training, and music education, and advises and oversees the Music Education curriculum. He is active throughout Southern California as a guest conductor, clinician, adjudicator, and freelance tubist. 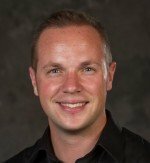 Dr. Hart holds the Doctor of Musical Arts degree in Conducting with a secondary concentration in Tuba Performance from The University of Iowa. He holds the Master of Music in Conducting from the same institution and the Bachelor of Music in Music Education from Concordia College in Moorhead, Minnesota. His principal conducting teachers include Dr. Richard Mark Heidel, Dr. Myron Welch, and Professor Bruce Houglum. Prior to his appointment at CLU, he served as a faculty member at Iowa Wesleyan College and was a graduate teaching assistant in the School of Music at The University of Iowa. Dr. Hart began his career as a band director in the Minnesota public schools teaching at the elementary, junior high and high school levels where his groups received superior ratings each year at state contests. As a tubist, he has performed with numerous ensembles including the Fargo-Moorhead Symphony and LA Symphonic Winds. He has appeared as a competitor, performer and conductor at the International Tuba Euphonium Conferences. At Cal Lutheran he continues to perform as a faculty soloist and featured soloist. His primary low brass teachers have been Professor John Manning and Dr. Nathaniel Dickey. Hart has been inducted into several honor societies including Phi Kappa Lambda, Phi Lambda Theta, and the Alpha Society. His professional affiliations include The National Band Association, Music Educators National Conference, College Band Directors National Association, World Association of Symphonic Bands and Ensembles, and the International Tuba Euphonium Conference.